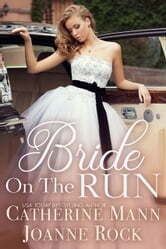 Bride on The Run is fast paced, entertaining and emotional! With a little bit of suspense and a lot of feeling, it was an easy book to fall into. I liked Valerie as much as I love the picture of her in a wedding dress on a Harley. Catherine and Joanne make her an easy heroine to root for, and hope for. Boone is stuck in the past, and has not let go of the fact that his fiancee dumped him - something he blames on Valerie, whether she deserves that or not. He was really fixated on this and it took a bit for him to move past this, which was quite annoying at times. But the attraction between Boone and Valerie is inescapable, and when trouble follows her, he is determined to keep her with him and keep her safe. It doesn't take long for them to see more in each other, but with her past and his future do they have a chance? There is a serious side to Bride on The Run, but overall it was a fun read that made my heart beat a little bit faster. I loved the secondary characters, especially Valerie's father who plays a significant secondary character even if we don't see a lot of him. Their relationship really helped shape the book. I'd recommend Bride on The Run to any romance reader looking for a smoothly written, entrancing read. I really enjoyed this book - co-written by two authors, which you don't see too often in romance. I loved the chemistry between Valerie and Boone. Having read the other Runaway Bride books, I didn't expect Boone (who had been dumped by Annamae Jessup on Valerie's radio call in show in Book 1 - The Wedding Audition) to get his own story. It's perhaps a little too coincidental that Valerie just happened to be of the Dimitri crime family that Annamae's husband had been investigating, but hey, it's fiction. Like so many contemporary romances, the beginning and the end of this novella are predictable: boy meets girl, and eventually they get together. However, it’s what happens in the middle here that is absolutely fantastic. This unique twist on a well-known fairy tale had me in stitches while at the same time my heart was on my sleeve. The characters in this story were charmingly delightful. Their personalities were the type that really drew me in. The realistic yet simultaneously out of this world situations that they found themselves in really brought the characters to life. I fell in love with them as they fell in love with each other. This fast paced novella kept me on my toes throughout. Mann & Rock have created a fantastic romance that brings Prince Charming to life in the real world. Please note that I received a complimentary copy of this work in exchange for an honest review.